Our cakes just get awesomer and awesomer. What do you mean that’s not a word?! Check out this cake – it’s the awesomist! Rainbow coloured gel food colours (I used red, orange, yellow, green, blue, purple – no indigo – I’m not totally sure I know what indigo even is) – these are fantastic – much better than the liquid colours of my youth – unbelievably string colours even when baked. I made the cake in three batches (partly because I only have one set of sandwich cake tins and one oven). – *Weigh two eggs and preheat the oven to 180 (165 fan). – Weight the same amount of butter (margarine) and sugar into a bowl and add a splodge of vanilla extract. Cream this until it goes white and fluffy (I did it with a stand mixer, but a hand whisk or wooden spoon is also totally viable). – Measure out (separately) the same weight of flour and add the pinch of salt. – Add the two eggs to the butter/sugar mix gradually and beat in (not too much, just till it’s all combined well). – If the egg/butter/sugar mix starts to look a bit curdled, just chuck in a little handful of the flour between egg additions. – Chuck in the flour and fold it in to the mix – keep it quick and only fold until combined – don’t overmix. – Split this mixture in half and colour each half with one of your rainbow colours. – Stick these two coloured batters into your sandwich tins and stick in the oven for about 15 minutes till they are cooked – they will be fairly thin cakes – this is a good thing – you are going to end up with six layers, after all. – When the cakes are cool enough, turn them out onto racks and leave to cool completely. – Frantically wash your bowls and tins and start again from * with the next two colours until you have six lovely layers. – When all your cakes are cooked, level them off as necessary (it matters more with more layers – you don’t want a Leaning Tower of Pisa cake for this one) and layer them up on a board with jam in between to stick them together nicely. – Refrigerate while you make the icing (for an hour at least). – To make the icing, stick the butter (at room temperature) and icing sugar into a bowl and beat (slowly at first – icing sugar is messy stuff) until all incorporated (it might be a bit crumby – that is fine at this stage). Again – you can do this by hand if you’re feeling strong, but icing is where those stand mixers really come into their own. – Add a good splodge of vanilla and possibly a splash of milk if things are looking a bit dry and beat frantically until it’s lovely and fluffy – it takes about 5 minutes in the stand mixer – probably more by hand. – Use up to half the icing to crumb coat your cake, making a nice smooth layer and locking all the crumbs in – it’s fine if it doesn’t look nice – it just needs to give a good base. – Refrigerate the whole thing overnight (or at least for a couple of hours) for the icing to set and chill. – The next day, spread the rest of the icing over the crumb coat – this time, make it as beautiful as you can! – I decorated the whole thing by spraying the icing all over with pearlescent lustre and then using stencils (cut of old bits of paper) to make clouds and spraying with blue. This is obviously optional, but I thought that since Rainbow Dash is a proper flutter pony, she’d probably quite like a sky background and it makes the cake a little bit interesting on the outside as well as being a rainbow inside. – Finally, I stuck my Rainbow Dash figure on top (she’s just plastic – I contemplated icing her on, but thought that, if it was my birthday, I’d probably prefer something I could actually keep afterwards) and chucked a couple of packets of Skittles round the cake to reemphasise the rainbow theme. 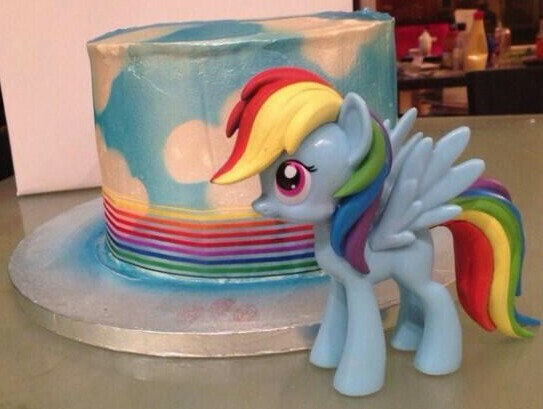 – Et voila – Rainbow Dash rainbow cake! Obviously these are at their best when they’re actually sliced and you get the whole rainbow effect, but I didn’t get to see that here (it always looks awesome, though). I am a slightly obsessive baker (and occasional and slightly lame blogger) in my spare time (such as it is), which is a little at odds with being a type 1 diabetic who doesn’t really eat cake. As such, I am always keen to find new cake victims, and the waistlines of my friends, family and coworkers, who have tended to bear the brunt in the past, are grateful to be sharing the burden with Free Cakes for Kids Hackney. In all seriousness, when I heard about FCFK, I raced to sign up – in some ways it’s a small thing – there are maybe bigger, more important causes, but the impact of small things, like cakes and parties when growing up, shouldn’t be underestimated, and I am keen to share some of my own childhood birthday experiences with people who might not otherwise get them – unthinkable for so many of us. And, on a purely selfish note, it has been really lovely to be able to make someone so happy with something so very easy! « Never work with children or animals…!